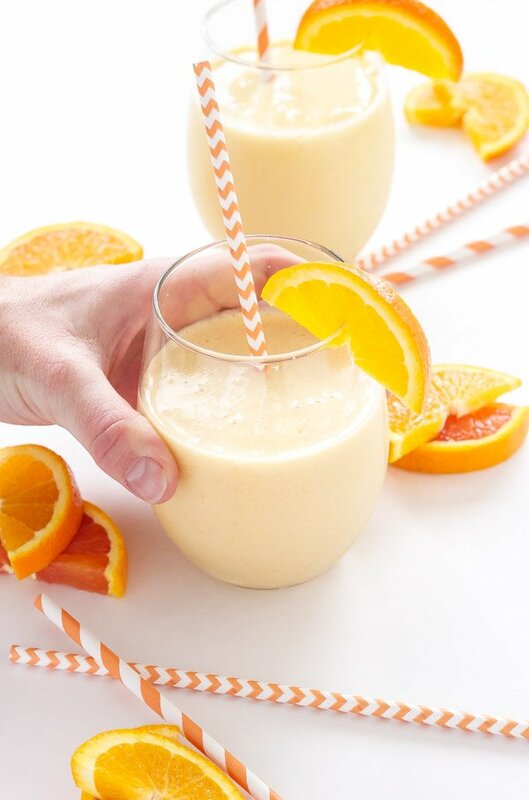 This Orange Creamsicle Smoothie is bursting with citrus flavor! 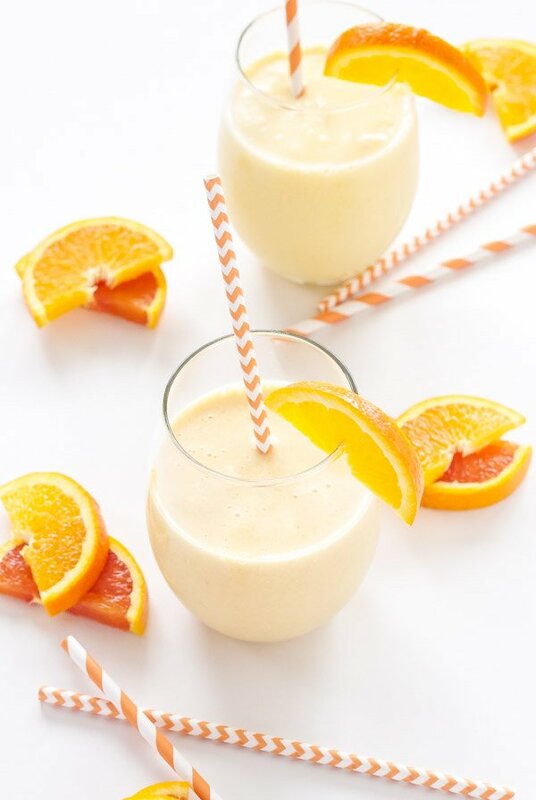 A creamy, sweet smoothie with the perfect combination of orange and vanilla! One of my favorite things about January is the abundance of citrus popping up in the grocery stores. Just the other day I was in Whole Foods and sweet Texas grapefruit, juicy navel oranges, and gorgeous yellow lemons were on display near the front of the store. Their fresh citrus aroma sucked me in and of course I had to fill my basket full of them. When I got home I knew the first thing I wanted to make with those beautiful navel oranges was an Orange Creamsicle Smoothie! I don’t talk a lot about the things I miss from Arizona, but aside from my family there is one other thing that I really miss, fresh citrus growing in the backyard. From the time I was a baby until a year and a half ago I have always had some sort of citrus tree growing in my backyard. Growing up my parents had two orange trees (and still have them to this day) that were always loaded with sweet oranges this time of year. It was so nice to be able to walk outside and grab a couple for eating or juicing whenever I felt like it. When my husband and I purchased our first house in Arizona it had a huge lemon tree in the backyard along with an orange tree. While the oranges in our backyard weren’t nearly as delicious as the ones at my parent’s house, the lemons were incredible! These lemons weren’t the itty bitty kind, no sir, they were about as big as oranges! One of my favorite things to do with the lemons aside from making lemonade was to make lemon bars. There is something about making lemon bars with lemons from your own tree that makes them taste that much better! Even though I don’t have the convenience of fresh citrus sitting in my backyard I still love using it this time of year. 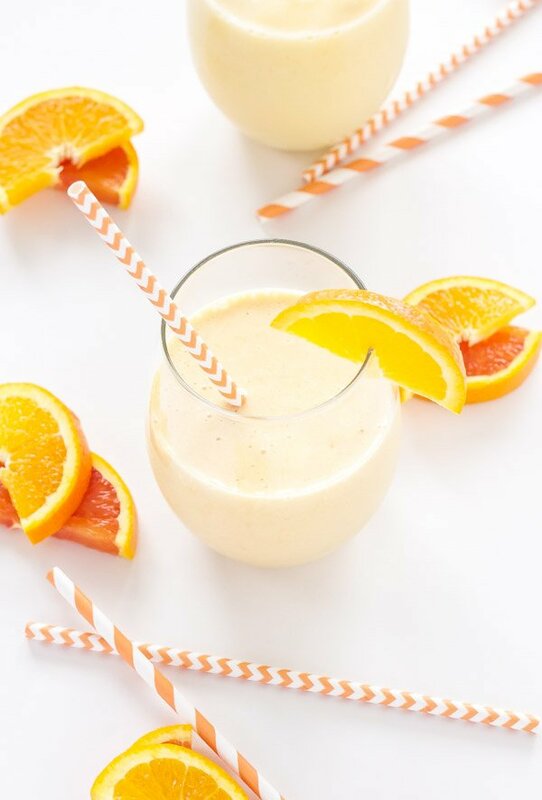 Making this creamy, sweet, Orange Creamsicle Smoothie was the perfect way for me to take advantage of it. Like the name implies, this smoothie tastes just like an orange creamsicle, except it’s healthy enough to have for breakfast. The smoothie uses only 5 ingredients! Oranges, Greek yogurt, honey, vanilla extract, and ice. You can sip on it leisurely after your morning workout or drink it on your way to work. Take advantage of the season’s juicy oranges and make on of these simple 5 ingredient Orange Creamsicle Smoothies! This 5 ingredient, creamy, citrus filled smoothie is packed full of vitamin C and calcium, making it the perfect healthy breakfast or snack! Pour into 2 glass and serve immediately. If you don't have a high speed blender or don't like pulp, I advise just using the juice from the oranges. 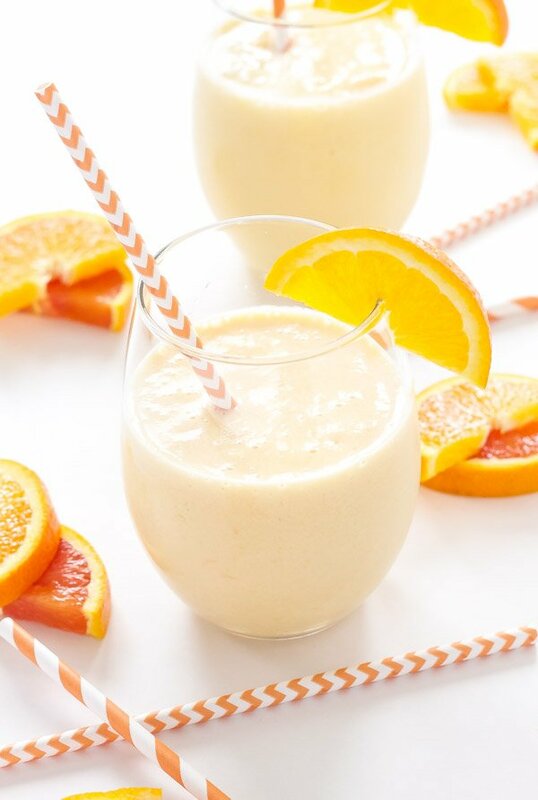 This smoothie looks incredible, I love oranges and creamsicle...oh my! I'm so jealous you've had citrus trees, here in Canada, not possible. lol! Is there a way to get rid of some of the pulp? I hate that I need to chew it. Thanks! Heck yes! I made an orange creamsicle smoothie ages ago using coconut milk and absolutely loved it, and I like the idea of using yogurt even more for a nice probiotic boost! 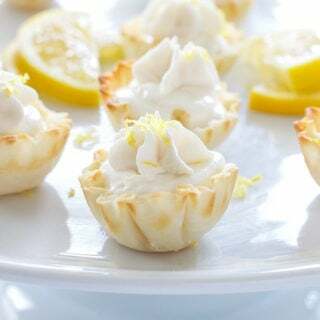 So sweet, zesty, and creamy. I must pick up some oranges and make this for breakfast all week! Thanks Julia! I love the idea of using coconut milk too, I'll have to try that one! All your smoothies last week really got me in the mood to make some! There is nothing like being able to pick fresh citrus from your backyard. I have so many lemons, kumquats and oranges, I don't know what to do with all of them. I guess it is a good problem to have because then I can make this delicious creamsicle smoothie! Thanks Carrie! I was definitely spoiled with citrus trees in the backyard and boy do I miss them now! 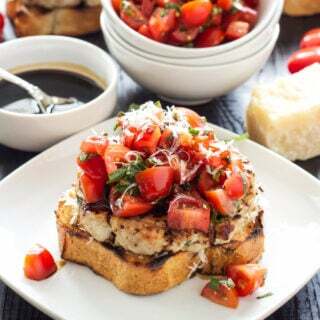 I want to make this but move the ads because they cover the whole page and I can't read the recipe. Question: once you peel oranges and separate them, the blender wil be able to pulverize it fully? I made this Orange Creamsickle Smoothie today, but made it with Vanilla Greek Yogurt instead of Plain. I also love vanilla, so I put in an extra teaspoon of vanilla. It was absolutely DELICIOUS!!!! I WILL make this again! It DOES taste like the Orange Creamsickles we ate as kids! I'm glad you liked the smoothie Cindy, thanks for trying it out! 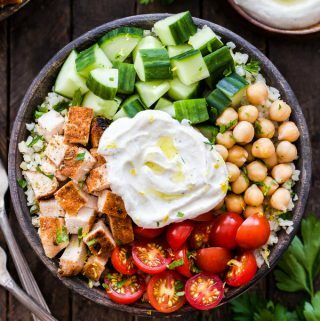 I made this before with Vanilla Greek Yogurt and my daughters and I loved it! Unfortunately, this time I don’t have oranges at home to use. Would you recommend using orange juice? Do you know how much I should use? Thanks! Hi Stacy, I'm so glad you're girls like the smoothie. If you don't have fresh oranges you can definitely just use orange juice. I would suggest using a 1 to 1 1/2 cups of juice.